In 1889 Harriet Chambers and Sarah Salmon had been in business at No. 141 MacDougal Street, on the southwest corner of West 4th Street, for several years. Their shop, H. Chambers & Co., was located in the street level of the 34-foot wide brick building. Above were three floors of dwelling space. But when the building was sold on May 2 that year, the women would soon have to relocate their business which was possibly a millinery or dressmaking shop. Max Danziger had purchased from Samuel C. Welsh not only that building, but the two abutting structures at Nos. 128 and 130 West 4th Street. He paid $33,000 for the package. The three properties were ripe for improvement. A year earlier The Sun had noted that the store in No. 128 had closed up, describing “the whitewashed window of the dingy shop.” Two weeks after he purchased the group, Danziger sold them to developer Martin Disken for $35,500, making a quick and tidy profit. Disken was well-known in real estate circles. He quickly commissioned the architectural firm of Thom & Wilson to design a five-story flat building to replace the vintage structures. Arthur M. Thom and James W. Wilson had produced a number of apartment buildings and rowhouses; but their best known works would come within just a year or two—among them the hulking Harlem Courthouse in 1891 and the New Criminal Courts Building of 1894. The architects melded neo-Grec, Romanesque Revival and Queen Anne style elements in their up-to-date brick, stone and terra cotta structure. Visual interest depended as much on the contrasting colors as on the decoration—including foliate bandcourses, fluted columns that upheld nothing on the balcony above the entrance, and honey-comb brickwork beneath the bracketed cornice. Two parapets, one above the entrance and another at the corner, announced the building’s name: Washington View. A brownstone, doglegged stoop let to the entrance, which was purely Romanesque Revival in style. Here a heavily-carved gaping arch embraced the double entrance doors. Door panels took the form of Japanese fans, a popular Aesthetic Movement motif. In marketing the spacious apartments to financially comfortable residents, Martin Disken had to deal with the address. Neither MacDougal Street nor West Fourth enjoyed the upscale reputation of venerable Washington Square. So he made up his own address: 39-1/2 Washington Square. The ploy apparently worked and well-to-do families moved in. But that was not enough for Disken to save his new building. He lost it in foreclosure on March 29, 1892. William McElroy purchased it at auction for $64,500—about $1.75 million in 2015 dollars. Among the first residents was Dr. W. E. Forest. Around midnight on Saturday, February 7, 1891, he was summoned to the Metropolitan Hotel “to attend Mme. Augusta Berg, a Swede, who occupied Room 445 on the fourth floor,” according to The New York Times a few days later. The newspaper said “He found her to be a stout, handsome brunette with whom time had dealt leniently.” He also discovered she was a morphine addict. Apparently “heroic treatment” was indeed necessary. Dr. Forest was called back at 10:00 the following morning. Madame Berg was unconscious. While he attempted all the remedies available, he put bell boys at work in relays to keep up artificial respiration for 15 hours. Finally, at 11:00 on Monday night she was dead. Dr. Forest was back at the Metropolitan Hotel in March 1894. Famous lawyer John Graham was unable to get out of his bed due to a severe case of rheumatic gout. Forest attended his patient, but 10 days later noticed what appeared to be gangrene on his foot. He consulted with Dr. William T. Bull who declared the case “hopeless.” They prepared to remove the foot. With the lawyer anesthetized but fully conscious they began. Graham looked at the group assembled around his bed, including his private secretary, two nephews, and business associates, and said “Gentlemen, are we about to hold a political convention?” They were the last words he would utter. Graham died in his bed at 4 a.m. on April 9. Despite a few lost patients, Dr. W. E. Forest retained his good standing and reputation. He became the house physician for the Wetmore Home for Fallen and Friendless Women, nearby at No. 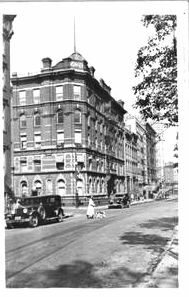 50 Washington Square South; and in 1898 wrote Massotherapy, a book which touted “the use of massage rollers in indigestion, constipation, liver trouble, paralysis, neuralgia and other functional disorders” rather than drugs or medicine. Denis Arnould, head of the candy-manufacturing firm D. Arnould & Co., lived in the Washington View with his 19-year old daughter, Emily, in what The New York Times deemed “handsome apartments.” Arnould’s professional success was in stark contrast to his private life. He and his wife had two daughters. Around 15 years after they married, Mrs. Arnould became insane. “His wife’s affliction had come upon him like a thunderclap,” said The Times. She was institutionalized and died in the asylum in 1890. A few months later, Emily’s older sister also went mad. The Times said “the shock of the mother’s death disclosed the fact that the eldest daughter had inherited a weak brain.” She was taken to St. Vincent’s Retreat at Harrison, New Jersey. When Arnould left the Washington View for his office on September 11, 1893, Emily was in good spirits. But 10 minutes before he returned home at 1:00, Mary called to the cook who was in the kitchen preparing lunch. Mary dropped her utensils with a shriek and ran to Emily’s bedroom. The girl was fully dressed, lying on the bed, and the room was filled with the odor of carbolic acid—a popular means of suicide in the 1890s. Mary’s sympathies were directed less on the self-centered girl than on Denis Arnould. The building's name is announce in the two parapets. On August 7, 1912 Theodore Roosevelt spoke in Chicago. His speech, the “Declaration of Principles of the Progressive Party,” laid out the Bull Moose platform. Some voters were shocked when it was discovered that the speech was edited and entire portions written by Robert W. Bruere. When a reporter called at the Bruere’s Washington View apartment for comment, he discovered the couple was in Wyoming on vacation. Bruere’s secretary was there, however, and was happy to give her opinion. Bruere would go on to become the Evening Post’s “investigator of labor conditions in the West” and he and Martha continued to write books, such as their 1913 Increasing Home Efficiency. A less controversial author, F. Lawrence Babcock, and his wife, Nita, lived in the Washington View at mid century. He was also an associate of Fortune magazine. A writer of industrial biographies, his best known work, Spanning the Atlantic—the History of the Cunard Line, was published in 1931. During World War II he was a war correspondent for Time magazine. Babcock was still living here when he died at the age of 54 in 1960. The 1960s were considered by the New Age movement to be the beginning of the Age of Aquarius. The coffee shops and tearooms of Greenwich Village became the centers of hippie culture with poetry readings, bongo drums and jazz. It was a situation that did not sit well with Washington View resident Mrs. George Voskovec, or her neighbor, Councilman and future Mayor, Edward I. Koch, who lived at No. 14 Washington Place. In response, Mrs. Voskvec and Ed Koch attacked. They charged “that, in violation of the midnight curfew, derelicts and ‘jerky kids’ were singing, screaming, setting off firecrackers and drinking alcoholic beverages.” One may assume that the “jerky kids” comment came from Mr. Koch. Although the Washington View has lost its historic ironwork on the 4th Street side balconette and second floor balcony, and was given a mid-century fire escape and modern replacement windows; little else has changed to its rather charming late Victorian exterior.